We know that times are changing. From being brazen in our industrial pursuits, there is now a growing awareness for the environment and the impact we have on the earth. We see this shift in our attention within the workplace too; from more dogmatic, hierarchical frameworks, we’re now moving into a more flexible, non-linear organisational structure. And along with these changes, we’re seeing a change in the way we work, interact and innovate. Without wanting to disregard any other reasons, we believe this shift is primarily because of a movement from a patriarchal system to a more matriarchal approach. We’re speaking from the point of view that we all have both masculine and feminine qualities within us, and that we need to learn to include and embrace our feminine values. We do not need to overpower our masculine values, but rather bring both equally into everyday life so that we experience more balance and harmony inside and outside the office. 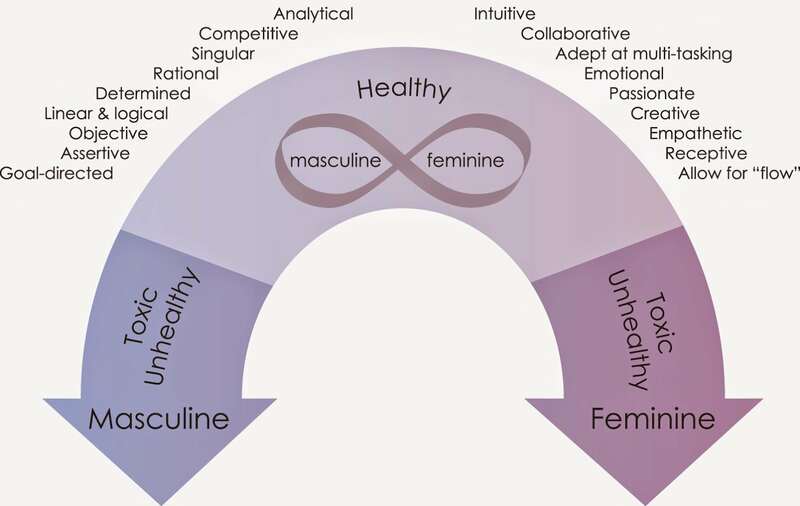 Without going down the Men are from Mars and Women are from Venus path, it’s important to unpack the difference between masculine and feminine values. It’s also important for us to recognise that we (yes all of us) have both masculine and feminine qualities. We’re all able to direct rational action towards a considered goal, as much as we’re capable of caring for an injured friend. We can fight the enemy as much as we can nurture those who follow in our footsteps. We can organise and control as much as we’re able to endure the ever-changing economic climate with grace and hope. The point is that we’re all capable of great power, and in the past, we’ve been more tuned into the masculine side. The shift that’s happening now is a call for us to respect and enable our feminine values to bring ourselves and our companies into balance. Thus, creating a healthy, happy and prosperous future. In the past our companies have been built on power, strength, perseverance and hard work. And while these are essential characteristics in a successful business, we can no longer negate the need for the feminine values of democracy, collectivism, social intelligence and communication. These values have often been, and are still considered, second rate in many workplaces. They are low on the list of priorities when we consider the bottom line, and independence, personal gain and individuality are the behaviours that are rewarded. With burn-out, stress, chronic fatigue, data overload and as we become an even more detached society, we need, more so than ever, to embrace feminine values in the workplace, and in our daily lives. The importance of having feminine values in the workplace is essential for the success of companies going forward, and the attitude with which we embrace this new shift will set the innovators apart from the rest. 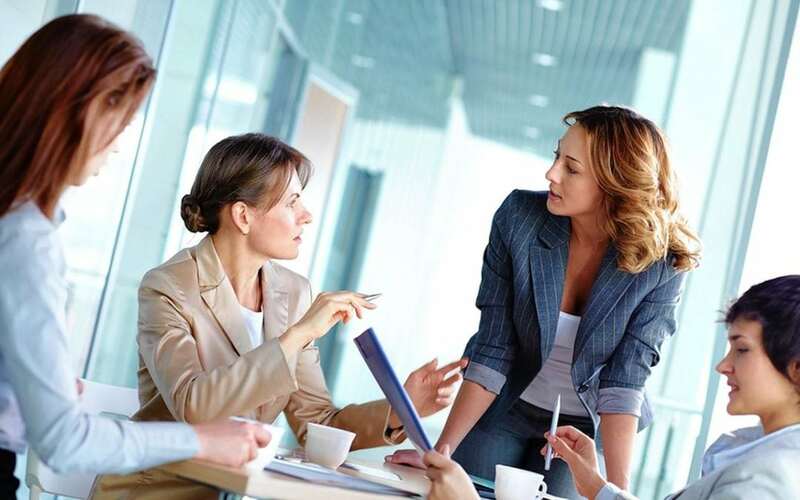 In the list below, we offer you eight fundamental feminine values that you need to consider and embrace to get the most from and for your team. The list includes the work of Anne Litwin and Joyce Fletcher, authors in the field of the feminine at work. Did you know that you have as many neurons in your gut as in your spinal column? That’s why you need to “trust your gut”. However, we’re taught from an early age to counter our intuitions with cognitive reasoning, as if these belly intuitions are less valuable than their brainy counterparts. There are two levels of intuition: the gut response or a “feeling” you get about a situation, and the judgement calls you make. These both need to be brought to your attention before taking action, or the impulsivity and indecision will leave your team feeling frustrated. The Lesson: Trust your intuition and make careful judgements. There is a large body of research that substantiates how women think differently to men. An appropriate analogy is: the male brain is like a filing cabinet (everything in its right place), while a woman’s brain is like a messy spider’s web (everything connected to everything else). This quality is often thought of as unfocused and less effective, however, this style of thinking allows for a more holistic perspective where everything is considered to ensure the best solution for all. This style of thinking often leads to increased creativity and innovation when problem-solving and can be especially helpful when doing strategy and business development. The Lesson: Consider your problem from all possible angles, including the web of impact it will have on those within and outside the company. The saying “the whole is greater than the sum of its parts” is exactly what this value is all about. The essence of collectivism is about finding the best situation for everyone involved. Clearly, this value was left by the wayside by almost all pioneering industrialists of the past – which is how we’ve ended up with the social and environmental repercussions we have now. To consider the collective is to ensure and empower the voice of every individual within your organisation. A democracy may be “ineffective” in a business setting; however, your staff are the first interaction your clients have with the company. If they’re unfulfilled or neglected, do you think they will provide the best service to your customers? The Lesson: Respect each part of the machine that is your company. A validated collective is better than any single individual. Relationships are the number one reason why people leave or stay in their job. This means that the connections made at work will directly determine how committed a person is to the company. It’s, therefore, an essential component to any successful business to enable and encourage healthy, professional connections in the workplace. Open, transparent communication which provides clarity, unity and motivation is sure to bring out the best in your team, and in turn, they will trust and support your decisions. Another valuable point here is that every individual has capabilities which will expand and enhance your company’s mission. When these skills and strengths are known and enabled in each individual, the organisation’s potential increases exponentially. The Lesson: Make a conscious effort to connect with each individual in your company. To understand another’s suffering and provide support and space is a truly feminine quality. And while you may feel that this may “not be appropriate for the workplace”, you’re sadly mistaken. We’re only one person and having a work personality and a home personality is tiring and is, fortunately, becoming outdated. Having empathy for your employees means you will recognise the difficulties they experience, and this will translate to your clients as well. If you practice empathy, you will become more in touch with your customers wants and needs. Empathy with your team can practically come down to flexibility – with time, hours and commitments. Flexibility increases engagement and staff morale and reduces absenteeism and staff turnover. The Lesson: Practice empathy and the rewards will be double what you put in. This value is perhaps one of the hardest to incorporate into a traditional corporate environment because of the built-in hierarchy and independent culture. However, a high-performing team will always outperform the individuals within the group and knowing the impact that every team member has on each other’s success is a valuable step in creating mutually beneficial and high-quality outcomes. Another point to consider is that when there is a culture of interconnection, there will be a greater number of perspectives, opinions and ideas which, when harnessed, can create far superior outcomes. The Lesson: Harness the power of interdependence and move upward faster. For many of us, emotions are things that are left at the door, or in a lot of cases not even expressed behind closed doors. The skill of engaging emotions in the workplace is an artform and will take years to perfect, but we have to start somewhere. Emotions are part of all of us and getting along is not always easy. 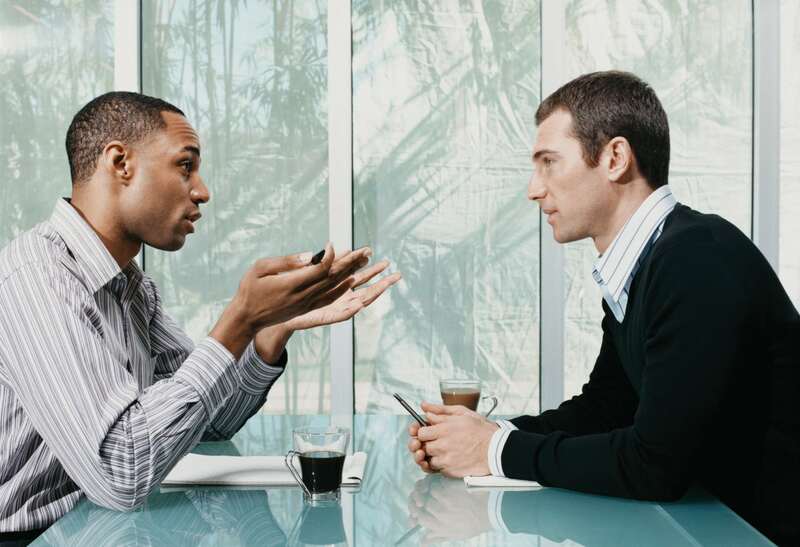 It is inevitable that people won’t always get along and this friction can be the source of most dissonance in the workplace. This does not end well and can lead to people leaving the company or disengaging from their workplace, creating an unhealthy culture. When we can openly own our emotions, they lose their power and we become more honest and authentic. This word authentic is not so simple to achieve, but it is a value which we need to strive for because when we bring our whole self to work we perform, connect, engage and innovate better. The Lesson: Encourage emotional intelligence through open, constructive communication and non-judgemental listening. We’ve all experienced it – the boss that makes our life a living hell. And hopefully, some of you will remember a leader who was a mentor, who saw your unique potential and helped guide you to become a better version of yourself. These are the kinds of leaders we need in this world – ones who support weaknesses and nurture strengths so that the workplace becomes a place of learning, growth and development. The Lesson: Be the leader you wish you had. Embodying feminine values is no longer a “nice-to-have”, but rather they’ve become necessary to remain sustainable, successful and balanced as a society. As a disclaimer before you go out and practice them: for each of the values mentioned above, there is a masculine counterpart that needs to be present for a good balance to occur. Please also remember that these are not female (gender) qualities, but rather the feminine attributes which are within all of us. You have the ability to become a powerful person for your family, community and company, but this requires the awareness, intent and knowledge of both sides of the coin. This article is written for anybody who wishes to embrace the shift and create a healthy balance in their personal and professional life. We wish you luck. We’re here to support you on your leadership journey.